Last month, 50,000 bumble bees died after trees in Wilsonville, Oregon were sprayed with dinotefuran, the neonicotinoid ingredient in Safari pesticide. This was the largest bee die-off ever recorded. Pollinators Such as honeybees, bumble bees, butterflies, and other insects play an important role in our farms, flower gardens, and food system. In fact, some of the crops most important to Oregon’s agricultural economy blueberries, raspberries, cherries, apples, vegetable seed, squash are reliant on bees for pollination and reproduction. More than 70% of America’s food sources are pollinated by bees and the worldwide economic value of these crops is as high as $200 billion a year. With bee populations declining across the country at an alarming rate, I urge you to support the "Save America's Pollinators Act" to restrict the use of these chemicals until we can be assured that they are safe and being used properly. From flowers to chocolate, berries to tequila, pollinators are integral to the planet, economy, and many aspects of our lives. In fact, the USDA estimates that about one in every three bites of food is either directly or indirectly made possible because of bee pollination. Both our environment and food supply are inextricably tied to the welfare of bees, making the decrease in bee population a cause for great alarm. The Save America’s Pollinators Act of 2013 directs the Environmental Protection Agency to suspend use of the most bee toxic neonicotinoids for use in seed treatment, soil application, or foliar treatment on bee attractive plants within 180 days, and to review these neonicotinoids and make a new determination about their proper application and safe use. Raising the public awareness of the integral role of pollinators to the world, the precarious state of their population, and what we can do to protect them is of the utmost importance. I’ll hope you’ll join me as a citizen co-sponsor of this important legislation. STEPHEN LACEY: MAY 22, 2013In a much-anticipated development, Tesla Motors said today that it had fully paid the government back for a $465 million loan it received in 2010 from the Department of Energy (DOE). 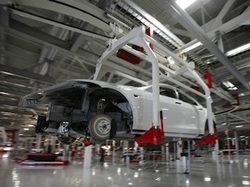 The half-billion dollar loan was used to build two manufacturing plants in California -- one for the Model S sedan and another for battery, motor and electrical equipment assembly. Accessing the loan meant that Tesla had to hit certain production milestones and raise private matching funds. The Motor Avenue Improvement Association and Palms Cycle have partnered with the local businesses of Motor Ave to create a bike festival for CicLAvia. This will allow participants in CicLAvia to stop for food, bike repairs, bike equipment, and a bike show, and it will support the Palms community. Corner of Venice Blvd. and Motor Ave. Striving to bring your faith-based life in contact with the principles of sustainability.